Thomas Phillips grew up with a reading disability. He did everything possible not to read. It wasn't until he was in seventh grade that he finally read a book from cover to cover. Now a voracious reader and prolific writer, Phillips uses his accomplishments as a motivational backdrop for speaking at school assemblies. Born and raised in Rochester, New York, Phillips has worked as a freelance journalist and currently works full time as an employment law paralegal. When he isn't writing, Phillips plays his guitar, is active in his church, coaches his children's Little League team, and plots his next story. 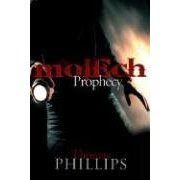 The Molech Prophecy is his first published Christian novel. Visit him at his MySpace, ShoutLife, and blog. The first things I noticed when I pulled into the church parking lot were the two police cars. Instinct wanted to kick in, but I stopped myself from turning my car around. The police weren’t there for me—couldn’t be there for me. I’d done nothing wrong. I wasn’t the same man. My days of running from the police had ended when I became a Christian. I reminded myself of this simple fact and felt a grin play across my lips. Thankfully, my days of running from the police ended four years ago. On any given Sunday, I have come to expect many things from Faith Community Church. And why not? I have been attending weekly services for years. I expect smiles from Faith’s Greet Team—from those helping direct cars in the parking lot to those handing out programs and pencils at the sanctuary doors. I expect powerful worship music, a variety of jokes from Pastor Ross—some funny, some not so funny—and I expect, each week, a message that will impact the way I live the rest of my life. But what I did not expect this morning was what I saw next: the complete defacing of the church building. Black spray paint covered the pecan-colored bricks in horrific graffiti. Seeing all of the graffiti felt like a punch to the gut. Faith Community was like my second home; the people who attended were like my second family. It was impossible not to take this attack personally. Slowly, I climbed out of the car, ignoring the early November morning chill. The wind blew relentlessly all around me, howling and moaning as if it too was furious and saddened and confused by the desecration. Other cars pulled into the lot. The people get-ting out of them emerged as slowly as I must have. I could see the stunned expressions on their faces—dropped jaws and wide eyes that surely matched my own. Who would vandalize a church like this? I wondered as I walked toward the entrance. As I stopped in front of the pentagram and took in the mess that attempted to dirty my church, I realized that who-ever did this was hurting—hurting badly. That thought did not stifle the anger—the righteous anger—I felt boiling deep inside. I nodded a grim good morning to the greeter who held the front door open as I walked into the church. The atrium is usually packed with people mingling before the start of the service. Free coffee, hot cocoa, and doughnuts set out on a table each and every week encourage people to arrive early for fellowship. This morning, however, only a few people lin-gered in the atrium. Whispers were all I heard. As I entered the sanctuary I saw that this was where everyone had gathered. I usually sit toward the back, far right, as if there were assigned seating. The things I’d seen outside left me feeling hollow and alone. Today, I sat closer to the front, middle row. I nodded hello to people here and there. Many sat with heads bowed, deep in prayer. I decided praying would be a good use of the extra time before the service. I tried to cope with a flood of mixed emo-tions, such as anger, sadness, confusion, disbelief, and then, once again, anger. Instead of praying, questions ended up filling my mind: Who could do such a thing? Why would someone do such a thing? How are we going to get that filth off the bricks? If I ever get my…. I broke off the last thought before it got out of hand. I’m in a church, I reminded myself. There is no place for thoughts like that, but especially not in a church. The service did not start the way services nor-mally did. The church band usually opened wor-ship with a fast-tempo song, one that got those present up on their feet, clapping and singing along, and one that brought those lingering in the atrium into the sanctuary. Today, in dead silence, Senior Pastor Ross Lobene walked out and stood center stage, grip-ping the podium. He seemed at a loss for words. I think he knew what he wanted to say but was afraid that if he tried speaking too soon, he might lose his composure. I wouldn’t blame him. As usual, roughly two thousand people filled most of the available seats. Two large projection screens hung on the wall at either side of the stage. Both showed a close-up of the pastor’s face. He could not hide his red eyes—or stop his quivering lips. I felt sorrowful pain in my chest. I nodded in agreement, listening intently and watching as Pastor Ross released his white-knuck-led grip on the podium and began to come into his own. He paced back and forth on the stage, addressing the congregation, righteous fire heating this impromptu sermon. As Pastor Ross paused, he stroked the sandy-colored goatee that covered his chin and used a handkerchief to wipe away the beads of sweat that formed on his bald head. “This, friends, this is a great opportunity for us to love our enemies as ourselves.” He pointed out at us and then pointed back at himself. “It is my desire to see everyone at Faith truly model this command from Christ and not become bitter by this incident. I pray that we have an opportunity to minister to the needs of the person or people responsible, so we can share the life-changing message of the gospel with them. I tried to let my own anger subside. If Pastor Ross could move on, so could I. All I needed now was help unclenching my hands, which had been rolled into solid fists since the beginning of service. Used by permission of the publisher, Whitaker House (www.whitakerhouse.com/ ). All rights reserved.